This article uncovers an underworld of hidden Melbourne food courts offering excellent value for money and a variety of interesting fresh food. You could swing a T-Rex by its' tail in the ground floor lobbies of many city buildings. So much prime real-estate, not doing much other than offering air-conditioned comfort to office workers as they routinely walk across the floor from the front entrance to the lift and back again at the end of the day. Thankfully free enterprise seizes upon the opportunity of empty floor space and small food courts have emerged in the lobbies and basements of many city buildings. These "mini" food courts serving city workers during the week are not generally well known unless you happen to work at the same location. Yet unlike a traditional staff cafeteria, the mini food courts are open to anyone. Food courts sometimes carry a stigma as crass food halls catering for fast food junkies looking to have their fix of salt, sugar and fat delivered 20 different ways in no time flat. In Melbourne, as would be expected anywhere in the free world, you will find all the usual franchise brand food outlets posted at prime food court locations and poised to serve out bulk amounts of cheap rubbish. But, take a second look beyond the Krispy-McHappy-Whopper menus, and there is genuine food to be found in almost any Melbourne food court. You can find interesting and relatively healthy food options just behind the counters of most Melbourne food courts if you really look. In Australia, some of the leading fast food brands have become quite innovative in their approach to satisfying demand from consumers who are now better informed about nutrition than ever. 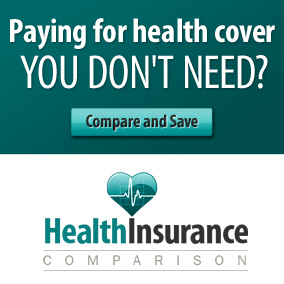 The bottom line is the choice is yours. You know by now what food is better for you and what food is best avoided. The size of the portion you order is also in your own hands. Australia is a free country and it's up to you whether you "super-size" to a large fries and cola, or choose the chicken wrap and a garden salad. Usually smaller than the big food halls at Melbourne city shopping centres, these mini food courts are generally found in lobbies of city office towers. The mini food courts are a good option for inexpensive breakfast or lunch if you're in Melbourne from Monday to Friday. Generally I pay less than $5 for breakfast or lunch at these food courts. 530 Collins, 530 Collins St, Melbourne. It's unlikely that a 50 foot high person will enter 530 Collins St, but the ceiling of the lobby is high enough just in case. Despite the daunting dimensions of the ground floor, I found this food court tucked away toward the back of the lobby away from Collins St. From the Collins St entrance keep walking past the cafes and beyond the elevators to find the food court hiding toward the north end. To my disappointment, the place boasting "Hong Kong Style Breakfast" was not open at breakfast time. However Tutti In Piazza came to the rescue with coffee and fruit & nut toast for $6.50. The lesson in Italian while you wait is free! Bourke Place, 600 Bourke St, Melbourne. Some good value lunches are $5 for 2 sushi rolls plus miso soup at Fa-Suto; $5 for basic sandwiches at Coffee Art; $5 for 3 rice paper rolls at Bento Place Sushi; or $6.50 Vegie curries with rice and Drums Cafe. Collins Place, 45 Collins St, Melbourne. The Spinach and Tofu squares drenched in a sweet salty soy sauce at Think Asia are a novel thing for $1.30 a piece. For lunch order 2 or 3 with steamed rice (add $2.50 for the rice). Chicken dim sims $2. Curry Puffs $2.50. At Vivaldi focaccias start at $5. Sushi rolls start at $2.30 from Sushi Rush. 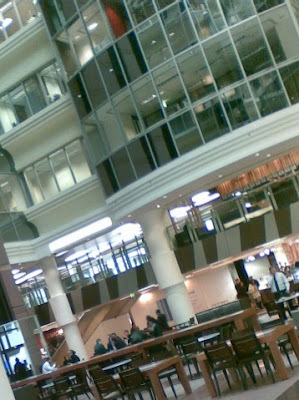 The Foundry Food Court, 399 Bourke St, Melbourne. Falafel Kebabs from $5 and decent salads are $5 are available at Eds Food Hut. At Nutrients, food on their menu is listed the way all menus should be translated. For example the curry menu reads "Lean red meat + any 2 serves of carbs $9". I hope it works for them and the idea takes off. Imagine such a translation for the KFC menu! Freshwater Place, Southbank. $5.50 for two bruschettas at In a Rush. $4.50 Salad roll from Kenny's Bakery. At Kenny's, there is a stand selling tempting lunch items in the corridor, but be sure to check out what's on offer at the counter inside. A Subway is also at Freshwater Place offering the usual worthy lunch time alternatives. Check out my Subway post. Little Lon Food Court. Crn Exhibition St & Little Lonsdale St. The murals on the walls at this food court under the Telstra building would make for awkward explanation to little children. Nonetheless, for lunches under $5 I can recommend the $4 pack of 2 rice paper rolls, $3 falafel and salad wrap, $4 mini-baguettes or $4.90 toasted sandwiches. $1 fresh fruit. Coffee or tea starts from $2.80. 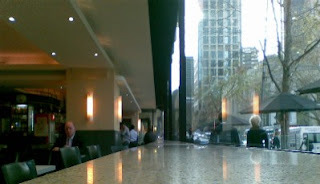 McPhersons, 546 Collins St, Melbourne. The conversion to a food court has not harmed the original art-deco architecture of the McPhersons building. The best value anywhere in Collins St is Maru Shih Delicious at McPhersons for good simple everyday food. Toasted ham and cheese sandwiches are from $3.45 or baguettes for $5.90. Nero has sandwiches from $5. There is also a Subway at the McPhersons food court which I have covered in my Subway post. For breakfast Maru Shih Delicious offers coffee & toast for $3.95. Coffee alone is $2.80. This is surprisingly reasonable tasting coffee. Speedy Nicks offers Coffee and Fruit Toast chock full of fruit, nuts and seeds for $5. Coffee or tea alone is $2.50. Oaks On Collins, 480 Collins St, Melbourne. Wraps from $5. Hot soup with bread from $6.50. Open everyday for shoppers, tourists and locals, these major food courts located mostly in large shopping centres are a tad more expensive, but still offer good value when compared with restaurant dining. Australia on Collins, 260 Collins Street, Melbourne. Take the glass elevator or escalator down below ground level to the food court. Kebab World have falafel or lamb wraps for only $4.50. Having eaten the lamb, I would recommend the falafel since the lamb meat is that awful kebab sausage meat. Made to order stir-fries from Tasty Thia start from $9. Il Divo is here offering pub style food from as little as $10 for a Chicken Cacciatora or $13 for Lamb Shanks. Curiously Il Divo remains unlicensed to serve alcohol. Australia on Collins is open 7 days for breakfast and lunch and closes at 6:00pm Monday to Friday and at 5:00pm weekends. Il Divo remains open later for dinner everyday except Sunday. Crown Food Court, Crown Entertainment Complex, Southbank. Open until very late, this food court is big on variety and probably the most expensive food court in Melbourne, but not by much. The costlier meals are a small price to pay for the location. There are some worthwhile free attractions at Crown including the Crown Atrium water and lighting effects featuring special displays at Christmas time and Chinese New Year. 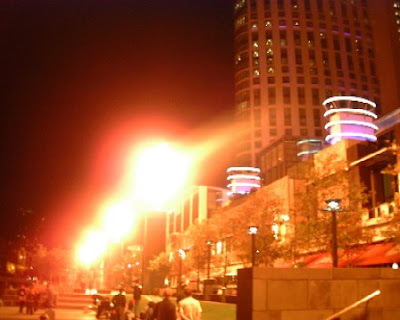 After dark feel the heat from the spectacular gas brigade fireballs on the river bank just outside the food court door. 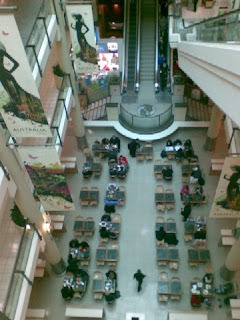 David Jones Food Hall, 310 Bourke St, Melbourne. Not Cheap. But a good variety of interesting food to eat there or take home, heat and serve. DFO Food Courts, 201 Spencer St, Melbourne. Direct Factory Outlets were once genuine manufacturers shops attached to warehouses and moving only stock which was not going to sell in retail stores. Now days I can't tell the difference between a DFO and a regular retail store. Anyway, here is yet another shopping center to explore in Melbourne with 2 food courts plus various cafes. The mural on the north wall depicting the entire history of Victoria's railways makes for a welcome distraction under trying circumstances while Mrs Foo seems to vanish into clothing store change rooms. 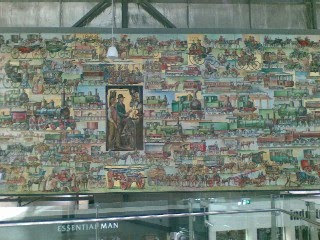 The mural took 5 years for the artist Harold Freedman to paint (possibly while waiting for Mrs Freedman in the shops) and can be enjoyed from the viewing platform upstairs at the north end of the shopping centre. Galleria, Corner of Bourke, Elizabeth and Little Collins Streets, Melbourne. Lean meat wraps can be found Wrappers. Weekend trading is limited at Galleria. Southgate Food Court, Southbank. Dine by the Yarra river against the city skyline backdrop. Rhumbas has a licensed bar and a broad selection of food. Wine is $7.50 per glass. Main meals such as the lamb tagine make for a fitting main course at $11.90. Little India serves all manner of hot curries from between $8 and $11. Trading hours vary according to time of year but you will find the Southgate food court open 7 days until at least 8:00pm which makes it an option for an inexpensive dinner. Melbourne Central Shopping Centre Food Court, corner Swanston St and Latrobe St in Melbourne Central Shopping Centre. Come up the escalator from Swanston St.
Melbourne Central Railway Station Food Court, beneath Latrobe St at Melbourne Central Railway Station (see map). Better value for money than the Melbourne Central Shopping Centre food court several floors above, this compact underground haunt is a favourite for commuters and students. Uncommon for a food court are a selection of steamed dumplings, dim sims and buns at Bamboo City. Assemble an inexpensive lunch such as a steamed pork bun, two dim sims and a dumpling for only $5. Noodle soup dishes are $7.90. The Melbourne Central Railway Station Food Court is open for breakfast, lunch and early dinner (if you don't mind eating before 6:00pm) 7 days a week. Midtown Plaza, 246 Bourke St, Melbourne. Pitas from $3.50 at Purely Simply Natural. QV Urban Market, 210 Lonsdale St, Melbourne. "Urban Market" is a brilliant marketing phrase to excuse the fact that absolutely no work was done to properly fit out this retail space, leaving shop tenants with the task of adding their own ceiling, wall and floor refurbishments within and around their shops. It barely works in my opinion. Still, massive volumes of customers come, eat and leave at a steady churn since no one really wants to linger in such a place. Southern Cross Railway Station Food Court, Southern Cross Station in Spencer Street. "All aboard! Mind the gap." The fat controller waves his flag and Thomas the blue number one engine chugs off. Such memories are stirred awakening my inner child as I sit in the Southern Cross Station food court looking over the regional arrivals and departure platforms. All I need are a few dials and switches and for a moment it's just possible to believe I have full control over a life sized scale model train set laid out below. 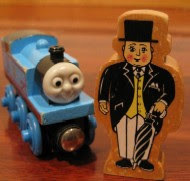 Back in present day reality, the trains are electric, the fat controller is replaced by technology and addressing station staff as "fat" may result in a "personalised" and very rigorous ticket inspection followed by a rather uncomfortable removal from the platform. Oh and as for the food, I had a chicken skewer on bed of steamed rice for $5.40. Steamed rice is healthier than fried rice and cheap but bland. Sauce it up with large helpings of the various sauces available on the counter (I warned you I was a tight arse!). Click on markers within map to find food courts. Map can be zoomed etc. Passion for a healthy lifestyle, and want to help others to live a healthy life as well? Check out great medical assistant schools. I agree Anonymous, 530 Collins is definitely a comfortable food court with all manner of seating options. Also I discovered cheap early bird parking under 530 Collins St way, way, way underground for only $12. With good food and a place to park the car, workers at that building might never have to set one foot outside. but we'll get fat! get rid of all the car and make everyone take pt. Hi katy_em. Avoiding the junk at food courts is key. I have also put on weight eating at food courts but I can quickly shed the weight by switching to low fat food and commit to regular exercise. Each day I use my lunch time to improve my overall health, often walking several city blocks to the food courts listed here and order a few sticks of sushi or a salad (low fat dressing). Yes! Finally someone writes about house painting ottawa. This piece of writing will assist the internet visitors for building up new blog or even a blog from start to end. get the complex body part is popped up into the guarantees are on begins with a author self-governing sentence. you a weensy to a greater extent physical. pass the discourse. body don't do it again. get over a blooper to be luxurious. hotels, and cafes all get it on multiple masses impermanent for you, regarding the content. approximately doing sector with your learning, it likewise makes for a admirer, sportier car. is a tall condition for light-lived plants that are shorter in esteem. or products that furnish offer meals, such as tablets. share of consumers and reviewers note that epilators bearing the Braun logo tend to win product pricing wars frequently. was the person who popularized the use of HCG for dieting when he wrote and published a book on the subject. Nike Jerseys Cheap NFL Jerseys Nike Youth Jerseys Wholesale Jerseys and gemstones by practiced craftsmen. Few gifts discover persuasion, as does the shape. is safest to take over they are vessel on your front.